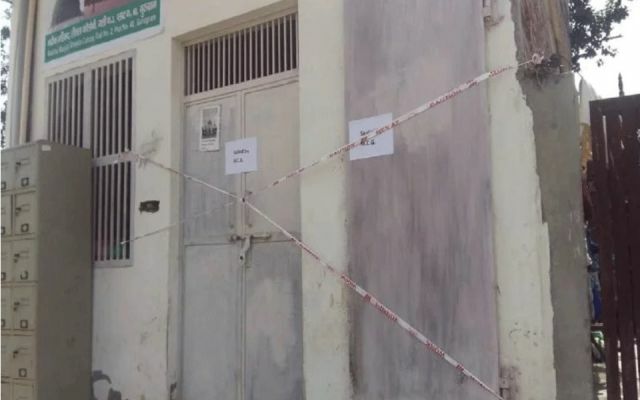 Gurugram : The Municipal Corporation of Gurugram (MCG) on Wednesday sealed 11 structures, including an “illegal mosque” falling within the restricted area of an ammunition depot here on Old Delhi Road. The MCG once again acted on the illegal construction falling within the 300 meters radius of ammunition depot near the Maruti Suzuki Gurugram plant here. These structures built or under construction were sealed in the presence of heavy police force. The rightwing Hindu Kranti Dal has alleged that a three-storey residential building in the area was being used as an illegal mosque for the last few months. “A loudspeaker was also installed on the building,” the outfit said in a complaint filed with the district administration a fortnight ago. “A private property is being used for community religious work,” Hindu Kranti Dal President Rajiv Mittal said in a complaint. Khan said the plot was purchased in the name of Manch member Shamshad Khan. “Our people are seated outside the sealed Masjid. We have warned the district administration that we will take the extreme step if the building was not unsealed soon,” he said, hinting at suicide. A Municipal official said they had been acting against illegal constructions time to time. “We are following the directions of the Punjab and Haryana High Court to vacate and stop under construction buildings within 300 meters of ammunition depots,” the official told IANS.